Maine's largest lake once bustled with steamboats ferrying folks from away. Now a filmmaker is diving into the stories behind the submerged wrecks. Growing up on quiet and isolated Moosehead Lake in the 1980s, where his father was a fishing guide, Ryan Robbins heard stories about the days when dozens of steamboats ferried swells from New York or Philadelphia to elegant hotels or rambling camps. And he wondered, what happened to them? 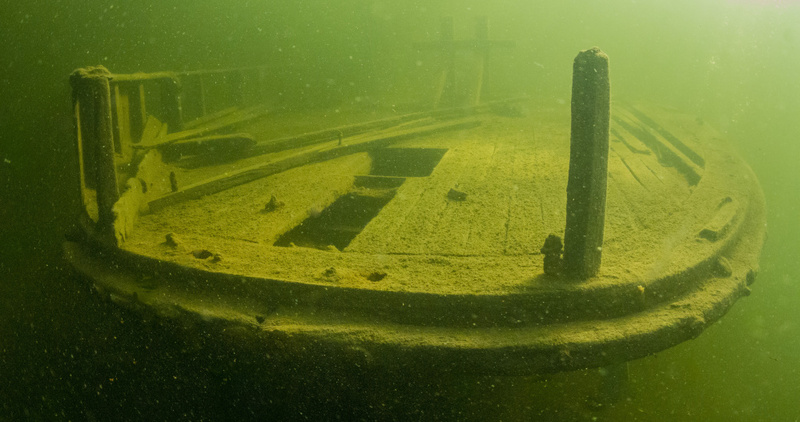 FOR MORE INFORMATION on the “Sunken Steamboats of Moosehead Lake” documentary film project go to Mooseheadsteamboats.com. To help fund the project go to gofundme.com/sunkensteamboats. Part of the answer could be seen about 5 feet from the lake’s surface, where timbers from the steamboat Twilight II were resting just off Steamboat Point, in Greenville Junction. That vessel, built in 1910, reportedly had been damaged by ice in the winter of 1943 and sunk. Locals told stories of other steamboats scuttled when their usefulness ended, now lying at the lake’s bottom. The port side hull of the Twilight wreck looking astern. The film will combine footage and histories of the sunken steamboats with interviews with locals who grew up in the area or remember the last steamboats hauling logs across the lake in the 1970s. The filmmakers – Robbins will be the film’s director and McKeil its executive producer – hope the documentary will illuminate a time in Moosehead Lake’s history when it was a bustling resort area. They hope to do oral history interviews this spring and some underwater photography this summer, but they have launched a fundraising campaign on gofundme.com to raise the $12,000 or more they’ll need. The project received a $5,000 grant from Weyerhaeuser, a forest products company which owns land in the Moosehead region, earlier this year. There are no firm distribution plans for the film yet, but Robbins is hopeful it will reach a wide audience eventually. 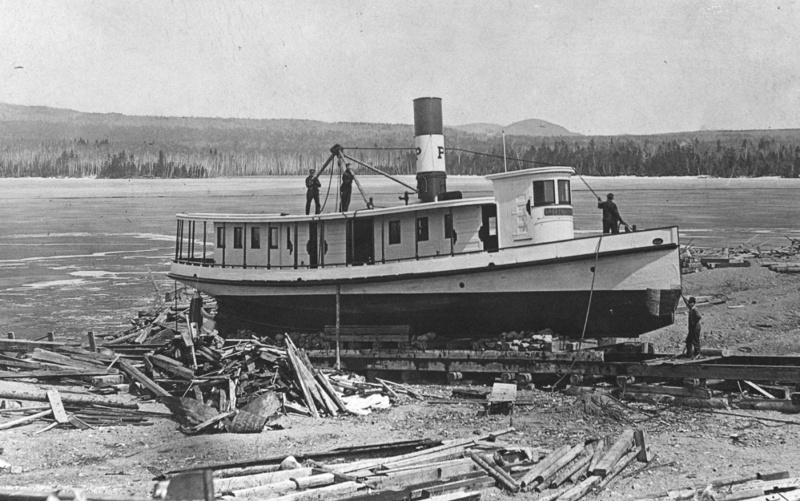 The Priscilla on the shipway at Steamboat Point on Moosehead Lake around the turn of the 20th century. The first steamboat on Moosehead Lake was underway around 1835, according to local historic records. Soon after, the area became a vacation destination. One of the first grand hotels in the area, the Mt. Kineo House, opened in 1848 and, over the next 100 years or more, grew into a luxurious resort with more than 450 rooms, a golf course and an orchestra that played twice a day. Future president Theodore Roosevelt visited as a young man, around 1870. Several other hotels and grand homes sprang up around the lake. 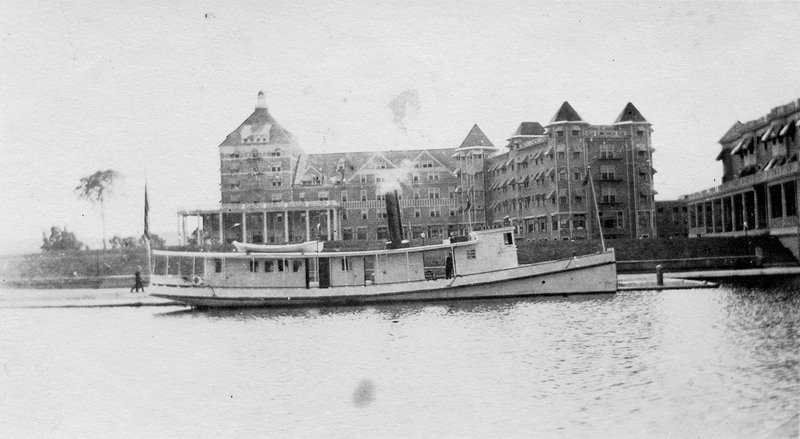 By around 1914, there were about 20 hotels around the lake. During the lake’s heyday, up until the 1930s or so, 50 or more steamboats cruised its waters. Some were small and privately run, taking throngs of tourists to lakeside destinations. Others were used by logging companies. Some of the larger public ferries, including the Twilight and the Katahdin, were owned by the Coburn Steamboat Company. In the 1930s, popularity of the resorts on the lake began to wane, a result of the automobile giving people the power to go where trains and steamboats couldn’t take them. In 1933, the railroad line to Mt. Kineo was eliminated. Steamboats could be found ferrying visitors and locals on lakes all over Maine in the late 1800s and early 1900s, said Walter Macdougall, a retired University of Maine philosophy professor and author of the 1978 book “Maine Lakes Steamboat Album.” Sebec Lake, south of Moosehead, had steamboats, as did Sebago Lake in southern Maine and Rangeley Lake in western Maine. It’s hard to say if any lakes had as many steamboats as Moosehead did. It’s the state’s largest lake, more than twice as big as the second largest, Sebago. 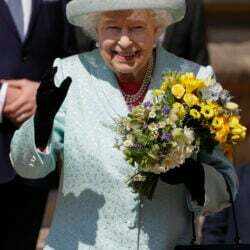 The area is very rural, and when tourism developed roads were scarce, so steamboats were an important part of the transportation system, Macdougall said. McKeil, 53, like Robbins, has a personal interest in the lake’s resort history and the mystery of its sunken steamboats. She grew up on the lake, and her father ran the Mt. Kineo resort in one of its later incarnations in the 1960s. She remembers the Katahdin being used in the 1970s to haul logs across the lake for Scott Paper Co. After the last log drive in the mid-1970s, the “Kate” was beached. The vessel, built in 1914, was just left on the land, its fate uncertain. A group of locals, including McKeil’s father, bought it for $1 and began work on restoring it. The group formed a nonprofit to maintain it as a tour boat and floating museum. The fantail stern of what is believed to be the hull of the Priscilla, one of nearly a dozen steamboats lying on the bottom of Moosehead Lake. 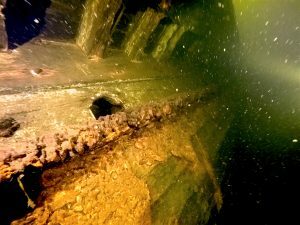 Filmmaker Ryan Robbins, the Moosehead Marine Museum and others are collaborating on a documentary film and oral history project about the vessels. This year marks the 40th anniversary of that nonprofit, known as the Moosehead Marine Museum, which has a small building for artifacts and runs lake voyages on the Katahdin in the summer. The boat had carried as many as 500 passengers in its heyday but is now permitted to carry about 225. As director of the museum, and because her father had been so involved in the lake’s history, McKeil was intrigued when she someone told her a couple years ago about Robbins’ diving expeditions to steamboat wreck sites and the YouTube videos he posted of them. Growing up on the lake, McKeil said, she had no idea that old steamboats, besides the easy-to-see Twilight, were sunk in the lake. But diver Chris Hugo began identifying steamboat remains in the 1990s, and other divers have explored them since. Robbins, who is a member of Moosehead Lake Divers with Hugo, says divers have found at least 11 sites where steamboat remains lay. 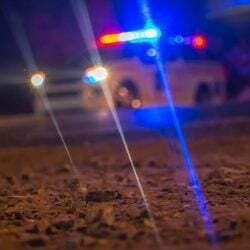 Not all of those remains have been identified. The Maine Historic Preservation Commission, which documents underwater archeology around the state, lists seven steamboats that live on the bottom of Moosehead, all at the south end of the lake: Governor Coburn, Twilight II, Priscilla, Fairy of the Lake, Kineo, and two that are unidentified. The steamer Kineo at Mt. Kineo House Resort landing in 1910. Robbins and McKeil say that it appears, from records and from anecdotal information, that most of the steamboats were intentionally scuttled. They outlived their usefulness, and when all valuable components were removed, they were sunk. Some were burned to the water line first, Robbins said, something divers can verify. In the film, Robbins hopes to focus footage and information on at least three wreck sites, the Kineo, the Twilight II and the Priscilla. The Twilight II is one of the sunken ships people know the most about, since it sunk one winter while still moored. It was 96 feet long and 20 feet wide, originally powered by steam but later by a diesel engine, and owned by the Coburn Steamboat Company. It was used as an excursion boat on the lake. For the oral history part of the film, Robbins and McKeil have a list of about a dozen locals to interview. Some have families that have been on the lake for generations. Some remember seeing the steamboats and some worked on the last log drives in the 1970s. “We want to be able to share this amazing period in the area’s history with as many people as possible,” said McKeil. The first wreck site Robbins saw underwater was the Kineo, a steamboat built in the late 1890s for the Mt. Kineo resort, though its sinking date is uncertain. Robbins hopes more information about the steamboats in Moosehead will be uncovered while the film is being researched and made. “I remember poking around (the Kineo) in 40 feet of water, in pitch darkness, seeing the shape of this steamship, and thinking ‘What else is under here?’,” said Robbins.